You are an entrepreneur who has just started a new business. 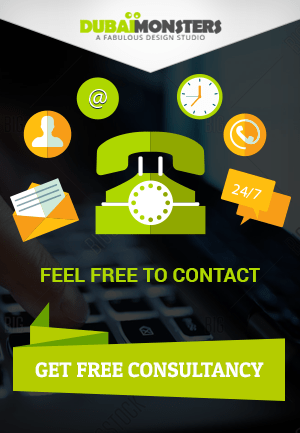 After analyzing the trends, you opt for digital marketing instead of traditional marketing methods to promote your products and services and get in touch with your customers. Social media is an integral part of your digital marketing strategy. You spend a major chunk of your marketing budget on social media advertising and marketing. Despite all the efforts and money you put in social media marketing, you are not getting the results you are looking for. The declining organic reach on social media channels, frequent algorithm changes, dwindling attention spans, and fierce competition adds insult to the injury. That is why social media marketers are looking for cost-effective alternatives to overcome these challenges. They are trying everything from paid marketing to videos, visual content to live videos and many more. Some of them work while others don’t. Check what works for you and then make it an integral part of your social media strategy. Here are four types of visual content that will help you to boost your social engagement. Statistics are a great way to deliver information that can surprise your audience but unfortunately, most brands are doing it the wrong way. Most brands present statistics in a form the combines visuals with text. Due to this, their content gets lost in the sea of similar content and never get seen by the target audience. Here are a couple of great examples of how you can creatively display statistics. 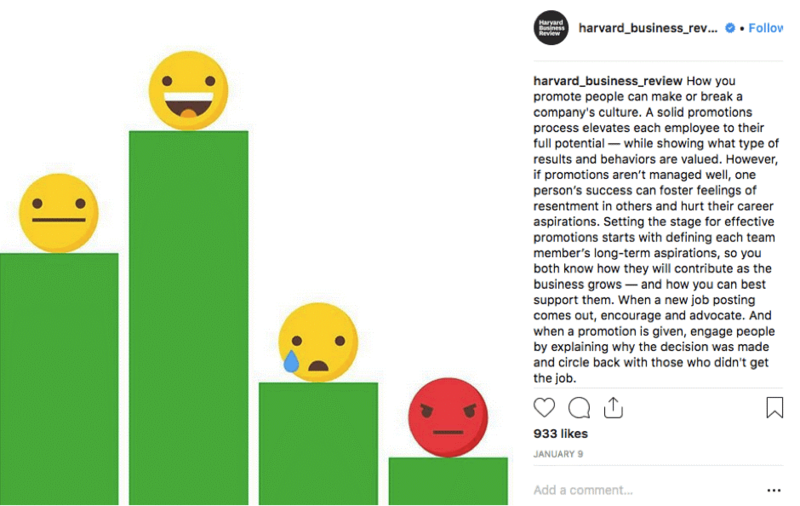 In the above example, Harvard Business Review smartly showed how a job promotion can potentially change employee perception of the company culture. 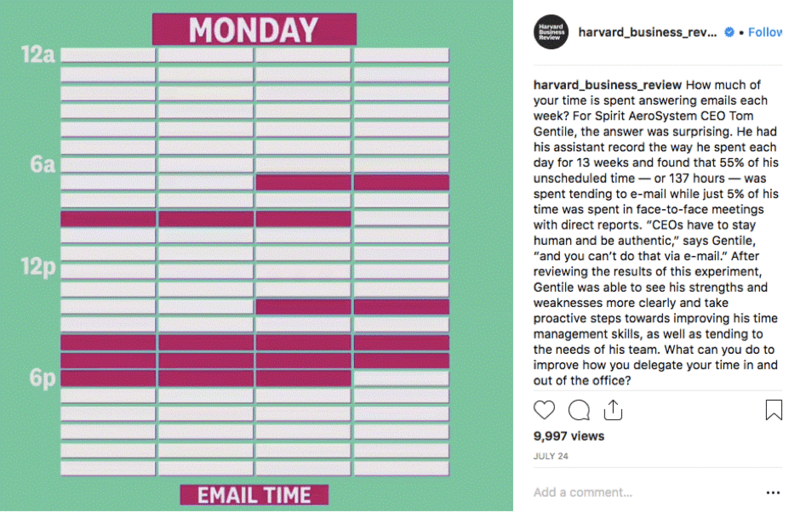 Another great example by Harvard Business Review showed how much time CEO spent on answering emails. So if you are using statistics, make sure you add the creative touch to it so that your users don’t scroll through it in their feeds and stop to see it. Artistic illustrations are vector-based illustrations that convey a powerful message with simple drawings. 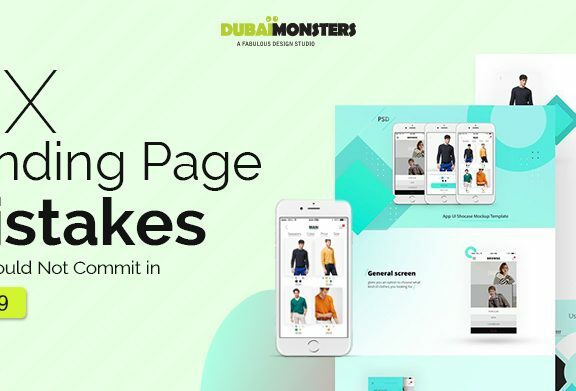 If you are planning to use artistic illustrations in your social media posts, make sure to accompany them with persuasive copy and use contrasting colors to make your artistic creations to stand out from the crowd. Want some inspiration or ideas for creating an artistic illustration for your brand? Here is how MIT Technology Review promotes one of their projects about how a human cell can fight infection. The illustration shows human cell with boxing gloves, throwing punches at infected cells. Another wonderful example of great artistic illustration came from Harvard Business Review. 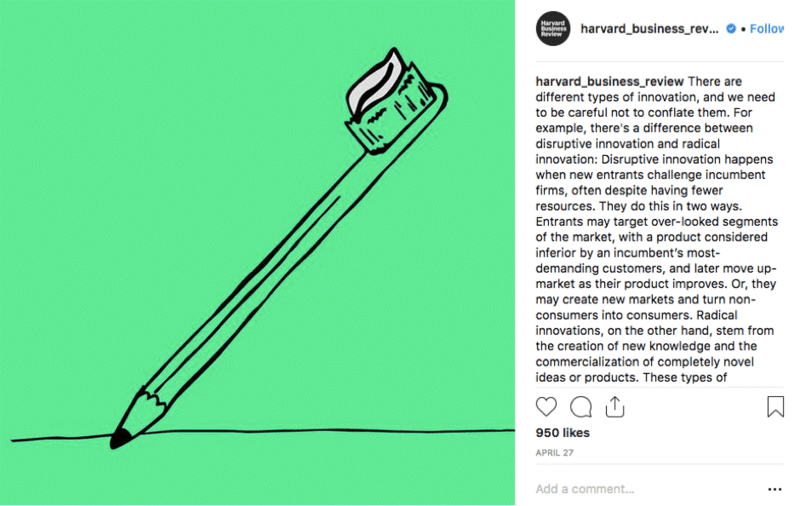 The post cleverly communicates the difference between radical innovation and disruptive innovation with the help of the copy. The image is also great showing a toothbrush at one end and pencil at the other end. 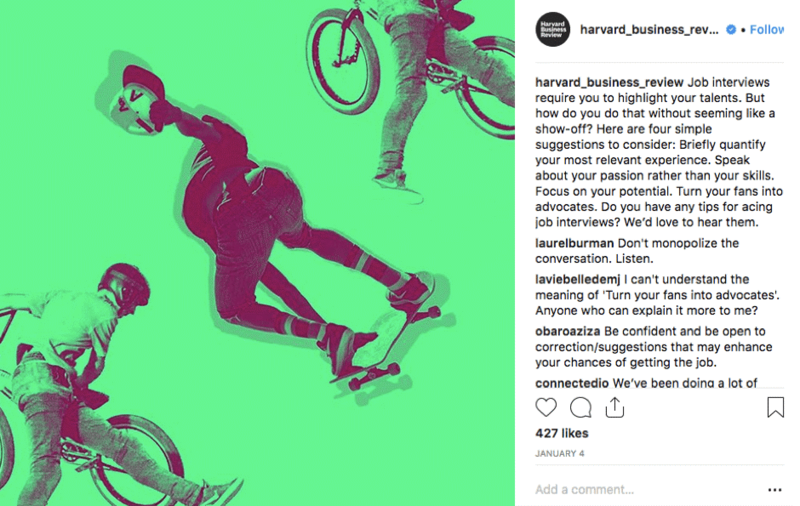 Just by looking at this image, it makes you curious what the post is all about and as a brand that is exactly what you want from your social posts. Not everyone is a great photography. It is a skill that only a few possesses. That is why the trend of filtered photography has gained momentum. You can make your simple photo look different and unique. All you have to do is to add a filter to it. Look at how technology review makes their average photo look outstanding by applying a pink color filter to it. You can also experiment with taking a photo collage by combining multiple photos together. 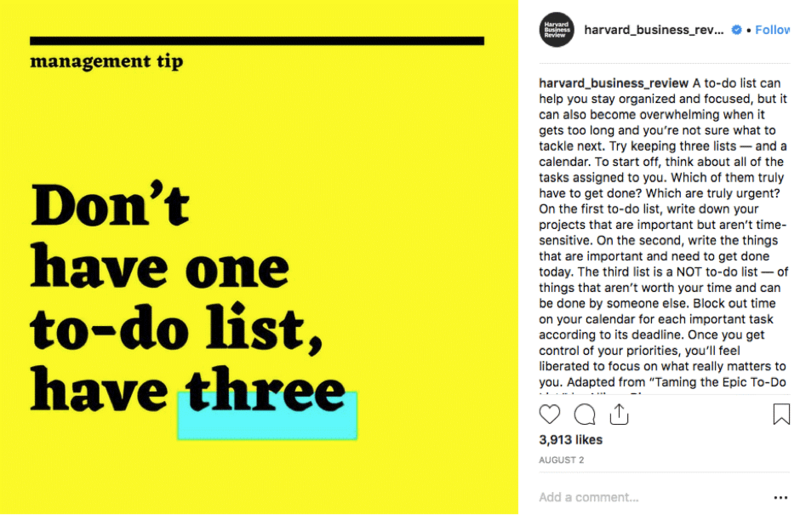 Select colors carefully to ensure that your post differentiates from the rest, so the user doesn’t scroll past your social media post when they come across it in the feed. Here is how to do it the right way by adding some layers and borders to your image. Have you ever come across a social media posts based on quotes? I am sure the answer might be yes because social media marketers and brands have both been using quote based social posts for quite some time now. Did you know why? Because these posts tend to generate more social media engagement as compared to other posts. Due to the overuse of quote-based posts, they are slowly losing its effectiveness to generate social engagement. 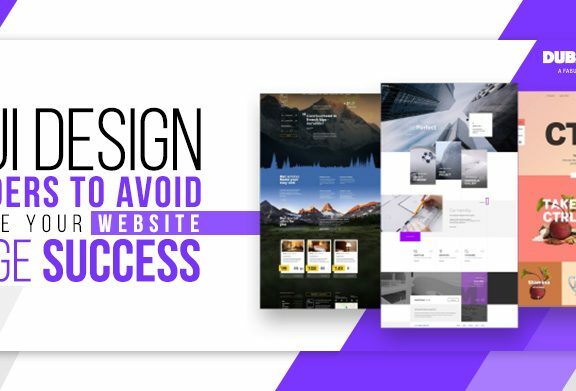 You can still achieve great results by experimenting with different colors, patterns, and typography. Here are two examples that will give you an idea about how you can make the most of typography in your social media posts. The above post uses yellow background and black text color that put the message into focus. 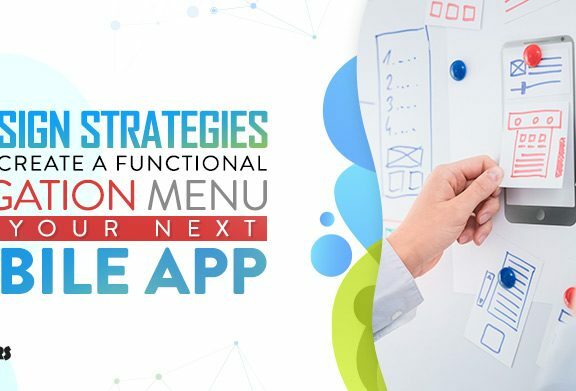 The contrasting colors help this post attract user’s eyeballs and they will surely notice it when scrolling through their feed. 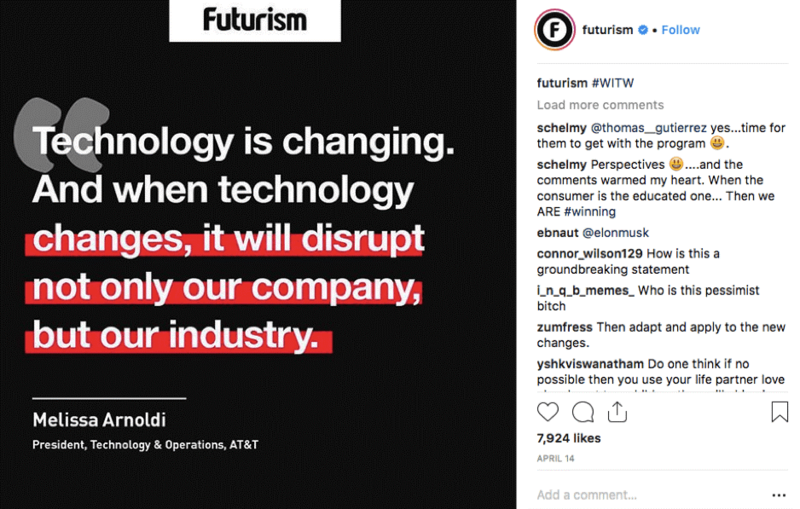 The second example came from Futurism who also puts the same concept to work in this social media post. The use of black background and white text color along with red underline puts the text in focus. You can also mimic these examples and add your own touch to it to enhance social media posts. Which type of visual content do you use on social media? Feel free to share it with us in the comments section below.